Megastar Rajinikanth's younger daughter Soundarya Rajinikanth tied the knot with actor and businessman Vishagan Vanangamudi yesterday in a grand ceremony. The marriage was attended by many political and film celebs. Kamal Haasan, who was personally invited by Rajinikanth, was also snapped at the wedding ceremony to bless the newlywed couple. 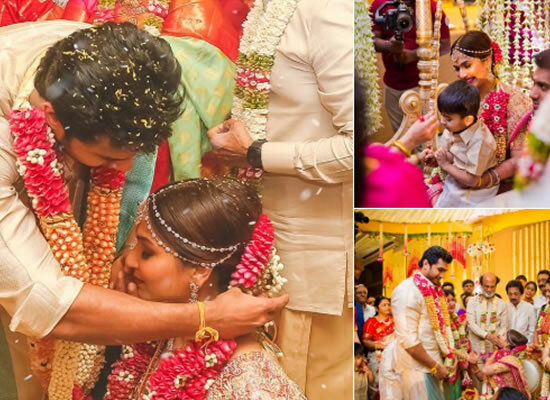 Recently, Soundarya Rajinikanth also shared three lovely photographs from the marriage yesterday. One of the pretty photographs sees Soundarya sharing an emotional moment with her parents Rajinikanth and Latha. The other 'Happy Family' photograph sees her son Ved sitting on her lap with Vishagan Vanangamudi sitting next to them. The trio sits on the oonjalas part of the Hindu traditions. The third photograph is all about the couple as they get married to each other. Soundarya took to twitter and shared these photos with a lot of emoticons saying, "#Mr&Mrs #MyFamily #WeAreOne #VedVishaganSoundarya." Home / Top Stories / Soundarya Rajinikanth shares an emotional moment with father Rajinikanth!